I think it is one of „must be played“ in South Africa. If you want to test your accuracy – let‘s try! I will be back and not one time. Played it for about the third time today. Course - good, condition - okay. Wow factor - 10/10. I cannot imagine there being better wow golf holes in the world than 9, 12, 13 and 18 at Pinnacle Point. Incredible views!! There are great golf courses and there are also great golf experiences, Pinnacle Point is in the latter for me but still enough to warrant a 5-ball ranking. Around the world there must be 100’s of ‘bucket-list’ courses, the must-play courses just because they are spectacular and normally very close to the ocean … Old Head (Ireland), Pebble Beach (USA), Cape Kidnappers (New Zealand) are in this category and I would now include Pinnacle Point. First thing to mention is that the clubhouse here is one of the very best that I have been in; great 360 degree views over several floors and a superb atmosphere. To the course; the first two holes are uphill and could be classed as weaker than many others on the course (I do think that any downhill hole has an advantage on the uphill ones on most courses though). The par-4 4th is SI-1 and a tough cookie at the highest point on the course and the start of holes back to the sea. The par-4 6th needs a drive over plenty of waste-land to a slightly mounded fairway and more of the mounds at the green, a little Irish links feel here. The 7th is the ‘camera moment’ on the front nine – and is probably many golfers favourite played par-3’s – this is an island green on top of a cliff and as dramatic as it comes and not unlike the 14th at Doonbeg, Ireland. More par-3 drama at the 9th – 200 yards (mostly carry) over rock and ocean – it is the time to be brave and not shy on this tee! The par-5 16th stretches to around 630 yards and is a great strategic three shotter with the green set brilliantly in front of the grass embankment. The closing hole will stick in the mind for ever; a par-5 playing along the Eden Bay cliffs with a 350 yard bunker on the left-side and a fairway with a severe movement to the left. 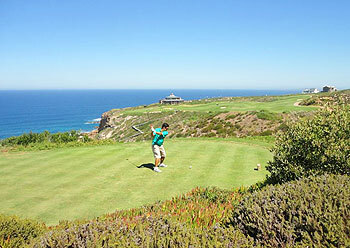 Playing at Pinnacle Point is likely to take a few rounds to get over the obvious intimidation that you will have on many tees but you will have such a great time – if anyone can get near to handicap and keep the same ball during a first visit, take a bow! I have been there in March and read a lot of different opinions before reviewing as this course is said to be great and rubbish at the same time and I got so messed that wanted to make a carefull review after listening to many opinions. The first thing to consider is to be objective to analize the piece of land given to the architect, he can be creative but cannot turn a 20m uphill elevation change into a downhill path! It is true first 3 holes are not great, but you play all the way uphill upto the highest point in the course, where views of the course, club house and ocean are astonishing. The you play downhill and 2 great holes (par 5 5th and par 4 6th) with dramatic carries. But when you arrive to 7th, a 140 yard par 3, you think #7 at Pebble is just standard: this par 3 with cliffs on the right and before the green is so dramatic that every bad shot will be in the bottom of the ocean. Then reachable par 4 8th is very criticized but with the piece of land give, I believe the result is a great risk-reward hole. and 9th a very nice par 3 with the Club House at your left and all the Ocean on the right, simply great. 10th and 11th 2 great par 4s, but 12-13 are two of the best holes, being 13th a par 3 were higher handicappers can feel really embarassed. The stretch 14-16 is not that special, but yet 3 great holes. but when you arrive to 17th the best has come: a great par 3 with views as good as they can get and where you need to be VERY accurate with the tee shot. And 18th looks very similar to finishing hole at Kapalua, I can say a finishing hole can be better!!! I was fortunate to play it on a sunny and little windy day, they say that if it blows it can make you really sick, but in my opinion it is just part of the challenge. People in my group had very different reviews and was surprised by Andy Waple's bad one (he is a 10 hcp). In my opinion this is a course to be played more than once, it is great and match play can be a great fun. You just need to focus on the challenge and go for it, but if visiting SA this is a must, and to be played more than once. Having also played 7 courses around the Cape this was by far my least favourite. On a number of holes there are spectacular views which makes the course special - that said it is a buggy course and you cannot get you buggy to several Tees and fairways which means not only have you no clue as to yardage you also have to take several clubs. This would be fine if it were not for the fact that you have to carry a rocks.Overral an experience at very reasonable cost but not a course to play if you wish to be near your handicap.